I am SUPER excited to be guest designing for Pinkfresh Studio! Pinkfresh has some super unique and really on trend embellishments, great stamps, and some super fun kits, too! Here is one of the cards I created for my guest spot. Be sure to head on over to their blog to see the rest of the cards I created using awesome Pinkfresh goodies! Also... in celebration of World Card Making Day, Pinkfresh has a fun challenge up! If you create a card inspired by one of my cards (on their blog) and link it up you could win a $25 Gift Certificate! WHAT?! That's AWESOME! I can't WAIT to see what you guys create and link up!!! This card is so cool! 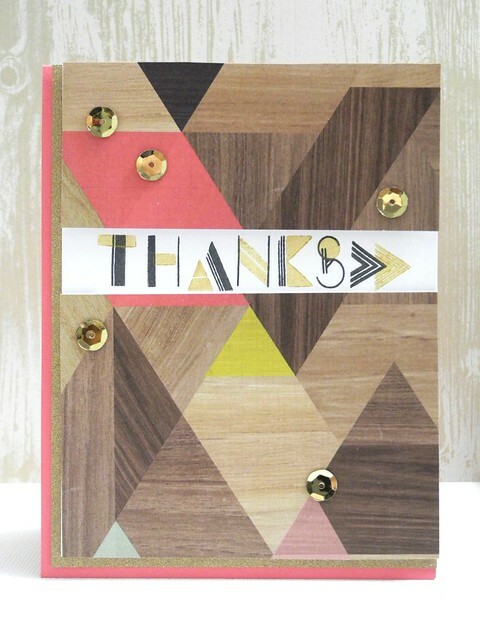 Love how you used the triangles in the design and how you placed the sequins in relation to the triangles. Another fave! Happy day to you! You are just so talented to make such inspiring cards! This looks like the wood veneer. I love it. Have to get some for my cards.